Did you know that cucumbers belong to the same plant family as watermelons, pumpkins, zucchinis, and squash? Cucumbers grow on vines and are available throughout the year. These are available in different shapes, sizes, and colors. The most common way of eating cucumbers is by eating them raw or as pickled. Cucumbers have been known to originate in India almost 10,000 years ago. What Are The Benefits Of Cucumber For Babies? Cucumbers contain 96 percent water and are loaded with various minerals. Eating a cucumber will produce twice the amount of hydration as having water. This also helps to remove toxins from the body and keeps your baby’s digestive system functioning smoothly(2). 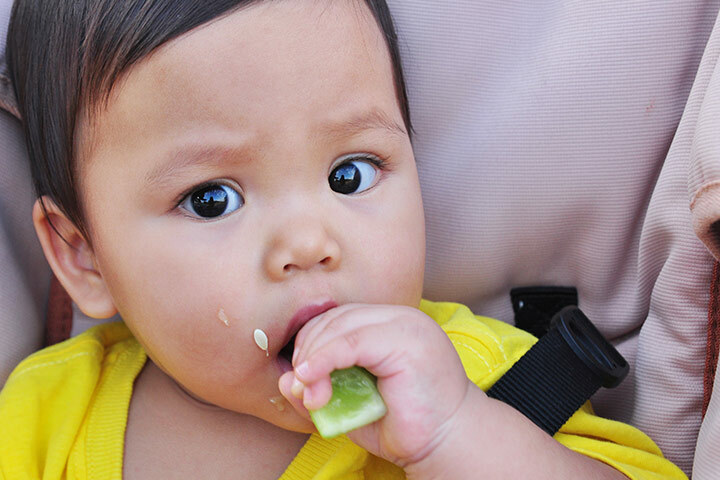 Eating cucumbers now can help your baby fight off cancer in later years. Cucumbers contain lignans like pinoresinol, lariciresinol, and secoisolariciresinol. These lignans are known to prevent and reduce the risk of various cancers like breast cancer, prostate cancer, uterine cancer and ovarian cancer. Cucumbers contain the hormone that helps the pancreatic cell to produce insulin. This is especially helpful in preventing and fighting off diabetes. The compound sterol(3) found in cucumbers is thought to keep cholesterol levels in check(4). Cucumbers are rich in calcium, magnesium, sodium, potassium and other minerals. Calcium is good for your baby’s overall bone density and strength. Magnesium helps in maintaining nerve and muscle function keeps blood glucose levels in check and also helps in producing energy(5). Sodium is required for your baby’s overall growth as well as brain and muscle development(6). Potassium helps in your baby’s growth, is good for your baby’s heart and also helps to build proteins(7). Cucumbers contain a big amount of silica. Silica is extremely important to make your baby’s bones strong and prevent osteoporosis. It is also very important for the strengthening of your baby’s ligaments, joints, and muscles. Silica helps to improve and strengthen your baby’s teeth and gums. It can also aid in your baby’s digestive system and strengthen the immune system. Cut the cucumbers into long strips and scrape out the seeds. Add all the ingredients in a bowl and whisk together with a spoon till it is of a smooth consistency. You can serve this cold or as it is. To make it healthier, add chopped fruits.